Real Salt Lake: Perennial Model Buster? If you take a look back at 2013’s expected goal differentials, probably the biggest outlier was MLS Cup runner up Real Salt Lake. Expected to score 0.08 fewer goals per game than its opponents, RSL actually scored 0.47 more goals than its opponents. That translates to a discrepancy of about 19 unexplained goals for the whole season. This year, RSL finds itself second in the Western Conference with a goal differential of a massive 0.80. However, like last year, the expected goal differential is lagging irritatingly behind at –0.77. There are two extreme explanations for RSL’s discrepancy in observed versus expected performance, and while the truth probably lies in the middle, I think it’s valuable to start the discussion at the extremes and move in from there. It could have defenders that make shots harder than they appear to be in each defined shot type–perhaps by forcing attackers onto their weak feet, or punching attackers in the balls whilst winding up. 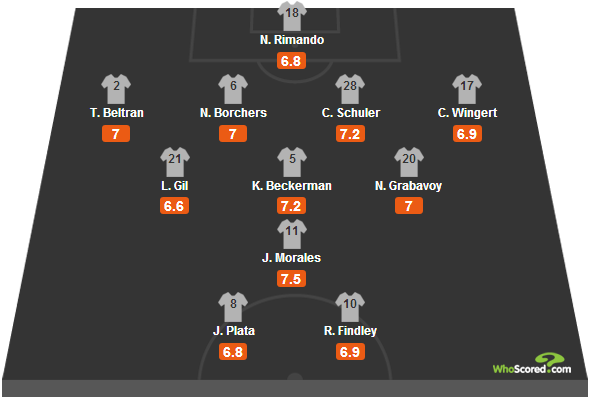 We know are pretty sure that RSL does indeed have the best goalkeeper in the league, and Will and I estimated Nick Rimando’s value at anywhere between about six and eight goals above average* during the 2013 season. That makes up a sizable chunk of the discrepancy, but still leaves at least half unaccounted for. Here’s the catch, though. Using the sample of 28 players that recorded at least 50 shots last season and at least 5 shots this season, the correlation coefficient for the goals above expectation statistic is –0.43. It’s negative. Basically, players that were good last year have been bad this year, and players that were bad last year have been good this year. That comes with some caveats–and if the correlation stays negative then that is a topic fit for another whole series of posts–but for our purposes here it suggests that finishing isn’t stable, and thus finishing isn’t really a reliable skill. The fact that RSL players have finished well for the last 14 months means very little for how they will finish in the future. Since I said there was a third way to fool expected goal differential–defense. 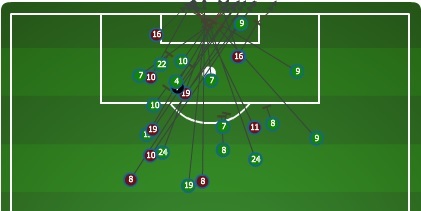 I should point out that once we account for Rimando, RSL’s defense allowed about as many goals as expected. Thus the primary culprits of RSL’s ability to outperform expected goal differential have been Nick Rimando and its top five scorers. So now we can move on to the explanation on the other extreme, luck. RSL has been largely lucky, using the following definition of lucky: Scoring goals they can’t hope to score again. A common argument I might expect is that no team could be this “lucky” for this long. If you’re a baseball fan, I urge you to read my piece on Matt Cain, but if not, here’s the point. 19 teams have played soccer in MLS the past two seasons. The probability that at least one of them gets lucky for 1.2 seasons worth of games is actually quite high. RSL very well may be that team–on offense, anyway. Unless RSL’s top scorers are all the outliers–which is not impossible, but unlikely–then RSL is likely in for a rude awakening, and a dogfight for a playoff spot. *Will’s GSAR statistic is actually Goals Saved Above Replacement, so I had to calibrate. These numbers are gaudy enough, but numbers like that are often indicative of a high-risk style of play, sending in large numbers of passes and crosses to in the hopes that a few of them will lead to dangerous scoring opportunities. 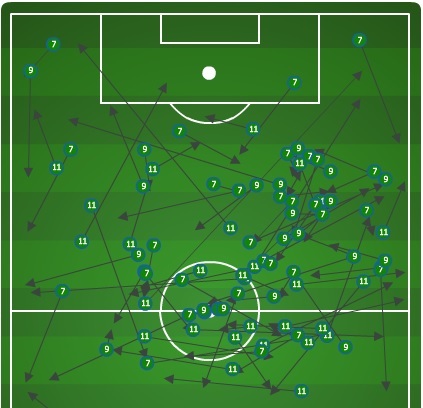 And while he does send in a lot of passes (Morales has attempted [2,327] and completed [1,857] more passes in the opponent’s half than any other MLS player over the last two years), what sets Morales apart from his peers is his effectiveness. While the average pass completion percentage of the rest of the top ten “key passers” (all attack-minded players) in 2013 was 76.6%, Morales’s was a hearty 83.1%. This number is inflated a bit both because he plays on such a talented, possession-oriented team and because he receives the ball farther from goal than, say, Thierry Henry or Robbie Keane, both of which lead to more safe ball touches. But even with these advantages, Morales should be regarded as one of the most talented players in the league, one who was unfortunate not to have been included in the MVP race last season. But how many times have you heard Ned Grabavoy referenced recently? If you listen to the media or fans, probably not very many, but if you’re taking note of the play-by-play man on an RSL broadcast, you probably hear it quite often. 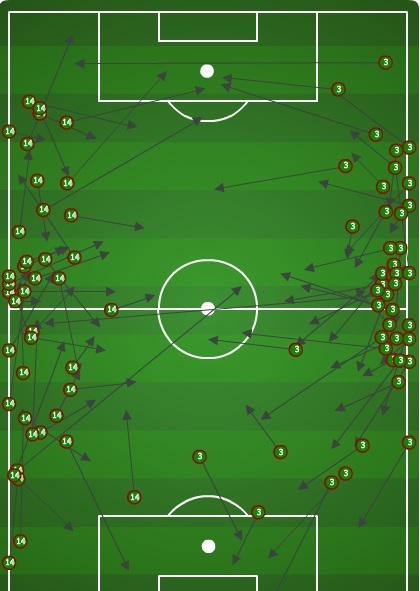 Grabavoy is everywhere on the field: relentlessly pressuring the ball (he finished 14th last season in tackles per game among midfielders), and then quickly and efficiently–far more than he gets credit for (86% pass completion rate, 4th best in MLS)–distributing it. Remarkably, despite all of Grabavoy’s defensive grit, he finished tied for 6th among MLS midfielders in fouls suffered with 63 (9th in fouls per game with 2.0), and committed only 37 himself. If that’s not enough, he pitched in with 5 goals on only 29 shots, intelligently taking 20 shots inside the box versus only 9 outside. Editor’s Note: This was the first of many articles by Jacob, who can be found at @MLSAtheist on twitter. It’s quite amazing, and I encourage you to read it. He’s one of several wonderful writers that we are adding to the site in the coming weeks. Please give him a follow and good feedback, as you have for Drew, Matty, and me. This is all part of putting together newer, better site content. This time we’ve got a couple of different leaders, as Federico Higuain and Mike Magee take the lead thanks to their trigger-happy styles. Higuain’s incredible number of key passes, despite playing for a middling Crew team, should raise some eyebrows—the dude’s an absolutely fantastic attacker. Just kidding, guys! Obviously the MVP debate should take more into account than who creates shots on goal. Defense, leadership, your team actually winning—all of these things should and do matter. But still, I think this was an interesting exercise and hopefully opened at least one set of eyes to how prolific Higuain is. Diego Fagundez is incredibly selective about his shooting – almost 70% of his shots hit the target. Javi Morales doesn’t shoot much for being so prolific at creating others shots. Reminds me of this post by Tempo Free Soccer—really interesting as far as categorizing attackers as shooters vs. providers.